Workshops are in addition to regular classes. This classes that I took at the senior center will give you some idea how they work and how you could possibly benefit. My ‘Fear The Floor No More’ Workshops will be both online and in person. They start from Sunday, March 24. Increase your energy, vitality, and confidence, book now. 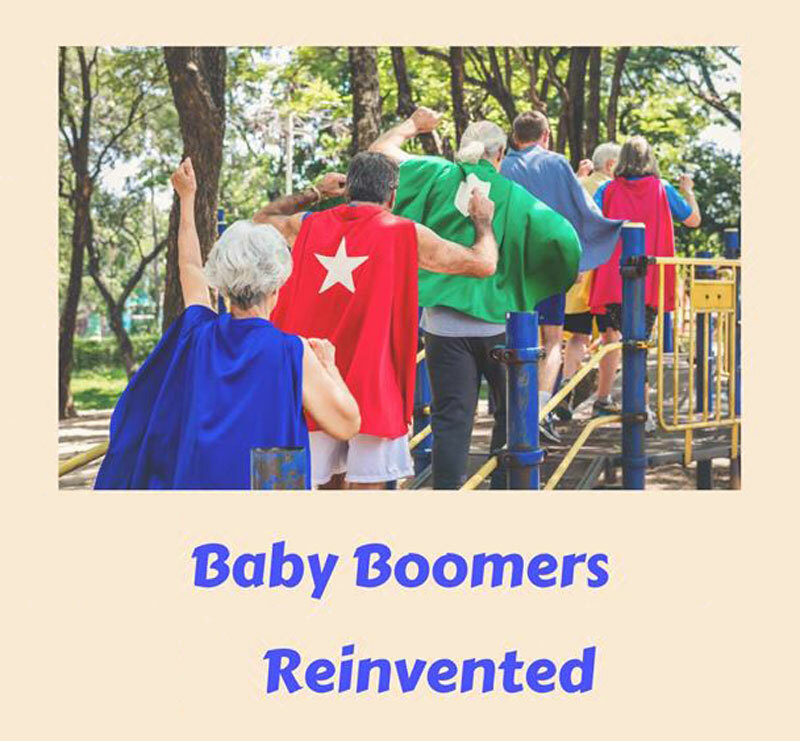 We’re Baby Boomers regaining, reclaiming and relying on our own authority and living with vitality! Baby Boomers, you know who you are, whether you are 72 or 55. Did you have a great childhood, buying good humors from the ice cream man and roaming the streets until the street lights came on? 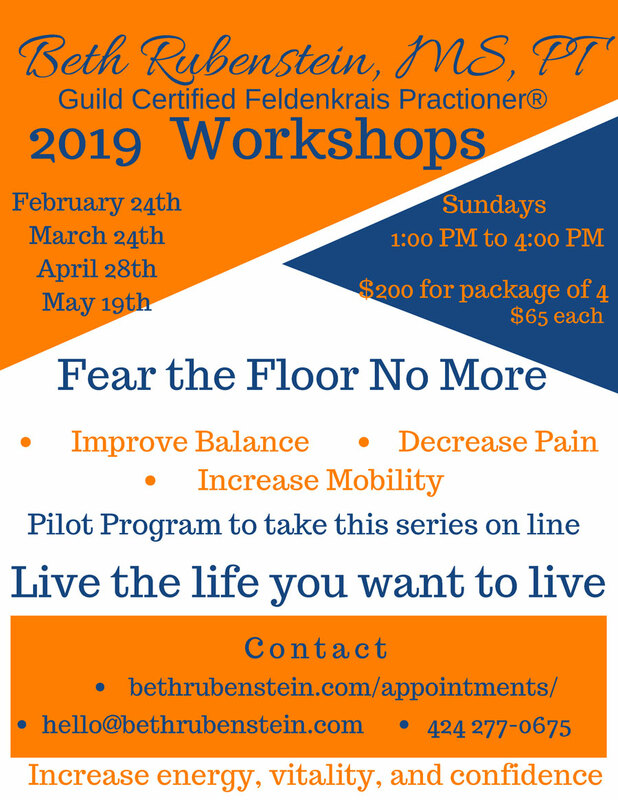 I started this group because I think that the gentle, easy, sophisticated, novel ways of moving that are taught in the Feldenkrais Method are what will keep Baby Boomers healthy, energetic, and vital and increase the ease of whatever activities you wish to do. Do you sometimes feel like you’re slowing down? You go to the gym, exercise and perhaps you still have aches and pains. Maybe you have a bit or a great bit of arthritis or any other muscular, inflammatory, postural problems that might slow you down? Do you still want to run, play golf, work out, dance? Are you retired or do you want to retire and live out those “golden years” in control of your life? This group is for you. I help you live the life you want, with energy and movement. We will be exploring ourselves and our ability to be experts on ourselves by using the method that I continue to explore, teach, and practice. Our generation has always marched to our own drummers. Let’s not stop now. You can also have an individual evaluation or session, or join one of my group weekly Awareness Through Movement® classes. Do you sometimes feel like you’re slowing down? You go to the gym, exercise and perhaps you still have aches and pains. Maybe you have a bit or a great bit of arthritis or any other muscular, inflammatory, postural problems that might slow you down? Do you still want to run, play golf, work out, dance? Are you retired or do you want to retire and live out those “golden years” in control of your life. This group is for you.